The historic royal residence on the Wawel Hill was turned into the national museum after World War II in 1945. Since the Castle was devastated after the 19th-century occupations and two World Wars, it had been being reconstructed for many years. It has now returned to its original splendour. There are several exhibitions in the Wawel Castle Museum – Renaissance and Baroque interiors in the reconstructed chambers and Gothic treasury room, complete with exhibited objects of historical and cultural importance. 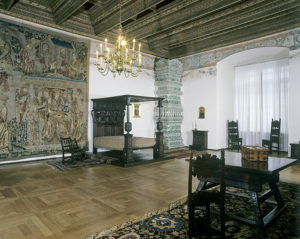 The main exhibition of the Wawel Castle Museum is in the royal chambers. On the second and first floor of the Castle, there are exquisite interiors complete with period furniture. Private chambers of the royal family are located on the second floor. This floor was entirely dedicated to members of the royal family, their court and guests. Chambers in the north-eastern wing of the Castle were dedicated to Kings. In this part, a mysterious tower called Kurza Stopka constructed in the 14th century, visitors can see unique Gothic interiors that survived the fire of 1595. In most of the other chambers, original Renaissance ceilings are preserved. Another interesting chamber is King’s Sigismund III cabinet with the oldest preserved in Poland stucco decoration from 1600. In 1920 a suite for President Ignacy Moscicki was set up in this part of the Castle when, for a short period of time, the Wawel Castle became the official residence of Polish President. The Presidential suite was reconstructed and is an interesting example of 1920s interior design. In the northern wing, there are two chambers with a collection of 18th-century porcelain, silverware, and carpets from the time of Wettin dynasty reign. The last two chambers, including a representative columned hall, were arranged in the Classicism style. 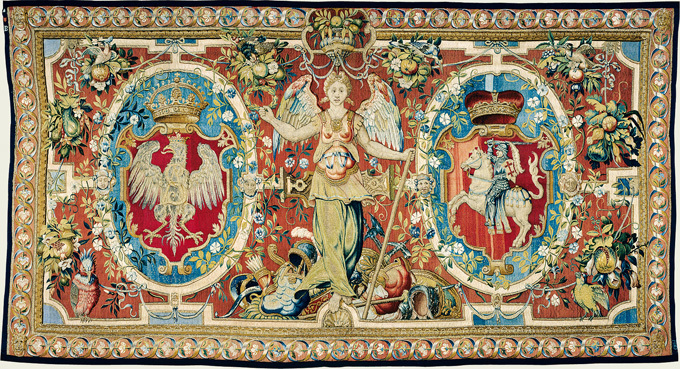 The most interesting collection in the Wawel Castle Museum is King’s Sigismund Augustus tapestries, made in Brussels around 1550-1560. This collection is the largest group of Renaissance tapestry in the world ever commissioned by one individual ordering party. Until this day 138 from most probably 170 units of this unique tapestry is preserved. The collection contains projects of leading artists of the time. The tapestry, made using top quality wool, silk, silver and gold thread, represent the highest artistic level. Scenes depicted on the tapestry have various subjects (biblical scenes, mythological scenes, landscapes and animal scenes, heraldry), but they all come together to one consistent collection. The second floor of the Castle is a principal floor, piano mobile. It is occupied by representative chambers. They are arranged in Renaissance style and refer to their original function. 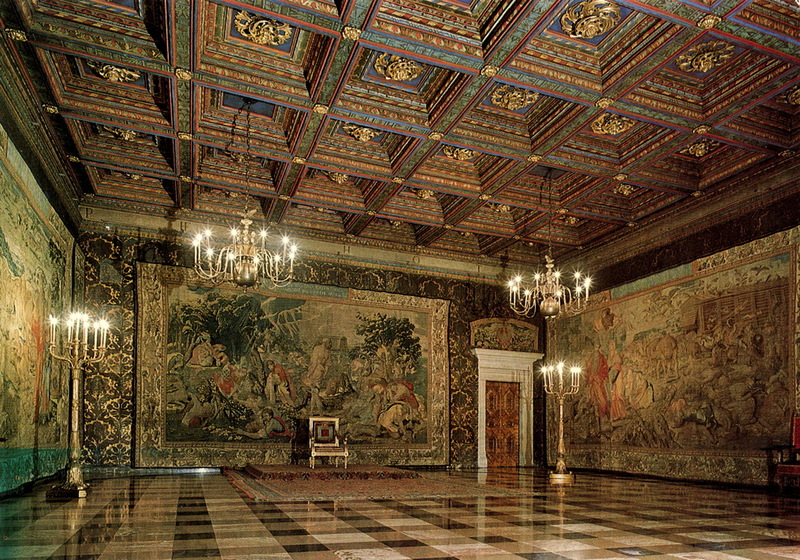 Senators Hall (Sala Senatorska in Polish), also known as Dancing Hall, is the largest room in the Castle. The Senators Hall was used for Senate meetings and important state ceremonies, as well as for royal weddings, balls, and stage performances. In 1518 the royal wedding of King Sigismund I the Old and Bona Sforza took place here. Now, tapestry from King’s Sigismund Augustus collection is displayed here. Deputies Hall (Sala Poselska) was a site of Parliament hearings with the King. It was also where the King was receiving delegations. The most intriguing and unique part of this chamber is the ceiling. 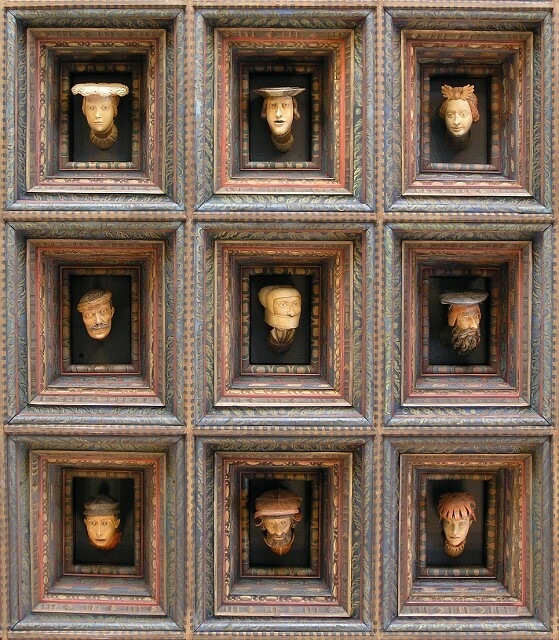 The coffered ceiling is adorned with sculptures of little heads of men and women. Originally there were 194 heads, but due to tumultuous past of the Castle, only 30 are preserved. Meaning of the ceiling is allegorical, heads depict people of a different class: kings, soldiers, courtiers. Tournament Hall (Sala Turniejowa) is the third chamber on piano mobile with such significance. It was a chamber for royal council meetings. Under the ceiling there is a 16th-century frieze with the depiction of chivalrous knights during a tournament – hence the name of this chamber. The exhibition on the ground floor of the Castle refers to the historical institution established in this chambers – the Crown Treasury. 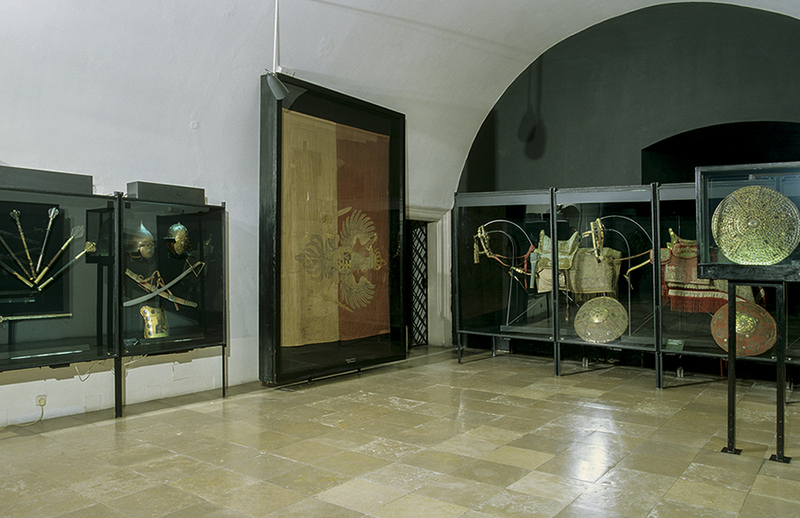 The exhibition contains a collection of memorabilia left after the ruling dynasties of Polish kings. Since the 14th century, the Royal Insignia were stored in the Treasury, as well as various jewels and curiosities that made up the official property of the state. There was a private monarch treasury alongside in the castle composed of personal valuables, jewellery, and ceremonial vessels. Crown Treasury resources, augmented by gifts and diplomatic records, were not public. Single valuables were removed from it only on special occasions, especially for royal coronations. In 1792 the first official exhibition of the Royal Insignia took place in the Castle. Three years later, when Prussia invaded the Castle during the last Partition of Poland, the Royal Insignia was stolen alongside with almost all of the content of the Treasury. After the destruction of the Insignia and perdition of almost all Polish treasury, the current exhibition can only refer to the former glory of the place. 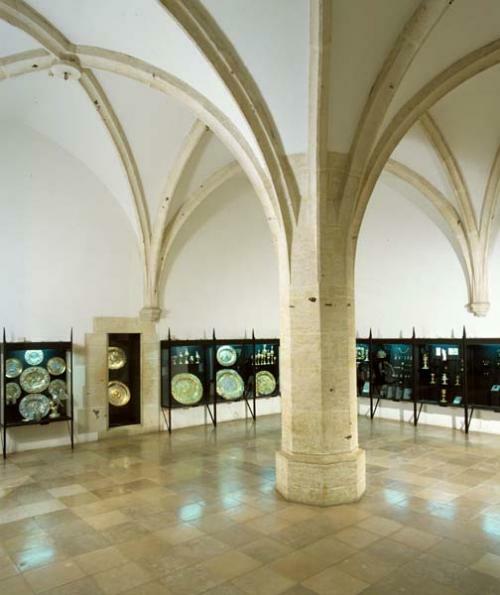 First room of the Treasury includes exposition of precious gems, (from 3rd – 18th century), medieval liturgical vessels (e.g. chalice of Casimir III the Great), various items of value associated with Polish Kings (e.g. pair of candlesticks with coats of arms of Stefan Batory, Sigismund’s III patera and chessboard , the jewel with the medal of Wladyslaw IV, a vessel in the shape of an eagle with pledges of Jan Kazimierz), as well as 16th-18th century clocks and donated to the Museum medals of the Order of the White Eagle ( Poland’s highest decoration awarded to both civilians and the military for their merits) and the Order of St Stanislaus (Polish order of knighthood, 1765-1917). Exhibitions in the next rooms compose of mostly of spoils from 17th-century Polish army campaigns, including the trophies from the Battle of Vienna of 1683, as well as armoury of Jan III Sobieski, his Order of the Holy Spirit (granted by French King Louis XIV in 1676) and examples of elaborately decorated horse saddles from the most eminent Turkish and Persian workshops. The most precious relic of the original Treasury is Szczerbiec, Polish coronation sword that was first used for the coronation of King Wladyslaw the Elbow-high in 1320. It was hidden during Prussian occupation in 1792 and returned to Poland in 1928. With the events of World War II, Szczerbiec was evacuated from the Castle once again and traveled the world to eventually come back to the Wawel Castle once and for all in 1959. 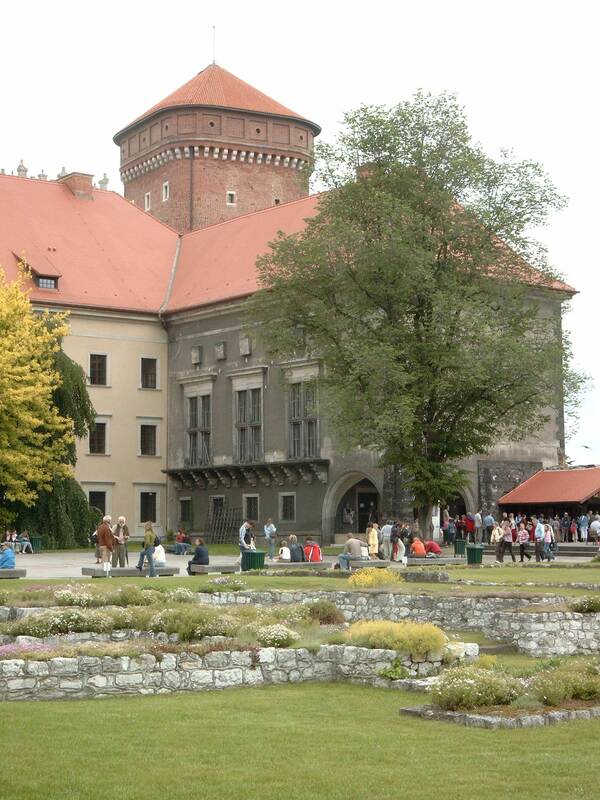 Szczerbiec is the most valuable and the oldest exhibit in the Wawel Castle Museum. 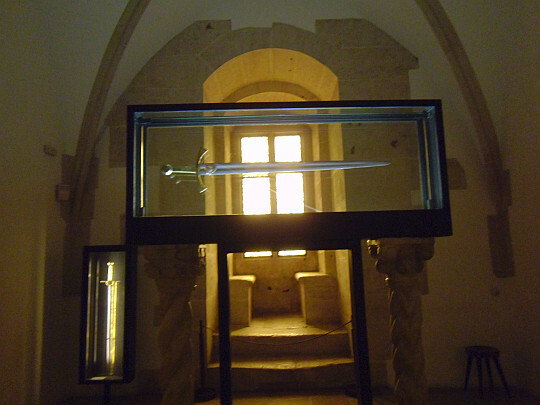 It is now on display in a special vault in the Treasury alongside with the sword of King Sigismund I the Old. Presumably, there was never such a place as the armoury in the Wawel Castle. There were though Kings’ private collections and equipment of the royal court members were also stored in chambers on the ground floor. They were often world-class objects and the most exquisite was the armoury collection of King Sigismund Augustus, who loved and appreciated art in every form. In four exhibition halls, the best examples of Polish and European armoury are presented. Most of the exhibits are Polish hussar armours from 17th century with a unique copy of the armour with wings. Another interesting armour is excellent in terms of aesthetics tournament armour from 1490 from the Artus Court in Gdansk. Particularly noteworthy is also a blade from the sabre of hetman Stanislaw Jablonowski, a participant of the Battle of Vienna of 1683. The Wawel Hill has been a site of archaeological research for almost a century. Thanks to its 1000-year-old history many unique relics and historical treasures were found. ‘Lost Wawel’ Exhibition (Wawel Zaginiony) focuses on presenting results of the excavations conducted here over the years. The exhibition is located in the building constructed in the 1940s by Germans during World War II in a place of former royal kitchens. In one of the exhibition halls, a unique collection of tiles from masonry stoves from the royal residence is presented. What is interesting about this exhibition is that it combines traditional way of displaying exhibits with fragments of buildings that once stood on these sites. Alongside medieval numismatics and ceramics from the royal court, architecture details and elements found during the excavations are displayed. The aim of this exhibition is not only to show these historic artefacts but also to present how building on the Wawel Hill evolved. Thanks to the fact that many Polish Kings were art admirers, many unique objects of art once decorated the Wawel Castle. In the times of Sigismund Augustus, unique Renaissance Dutch tapestry covered the castle’s walls. His 17th-century successors, however, were more interested in Eastern and Orient Art. The most exquisite objects arrived at the Castle especially during King’s Jan III Sobieski reign (1675-1696). Persian and Turkish products were bought from the best artists, but also brought as diplomatic gifts from other rulers or as war trophies. The biggest part of King’s collection are weapons gathered on the battlefield of the Battle of Vienna in 1683. The unique object of this collection is a sabre of Kara Mustafa, the leader of the defeated army. The Museum also owns twelve Turkish tents seized by King Jan III Sobieski, but due to their poor state, they are only displayed on special occasions (the last presentation took place in 1983, the 300th anniversary of the victory in Vienna). Tue-Fri: 9.30 a.m. – 5 p.m.
Tue-Fri: 9.30 a.m. – 4 p.m. Sat, Sun: 10 a.m. – 4 p.m.
Tue-Sat: 9.30 a.m. – 4 p.m.
Crown Treasury and Armoury Mon: 9.30 a.m. – 1 p. m.
Mon: 9.30 a.m. – 1 p. m.
** Last visitors enter one hour before closing. Ticket offices close 15 minutes earlier. For conservation reasons, daily limits of visitors apply.